Diabetic retinopathy (damage to the retina from diabetes) is the leading cause of blindness in Americans (5.3 million people) aged 20-74. In most cases, this vision loss is preventable. Diabetes can affect vision in many ways. Some vision changes are temporary and some are permanent. Temporary changes are due to unstable blood sugar levels. This can cause a temporary swelling of the natural lens in the eye. Until blood sugar levels are stable, it is not advisable to measure for a new glasses prescription. Permanent vision loss can occur when there is abnormal blood vessel leakage or growth, and possible bleeding and/or swelling in the retina. Macular edema (swelling) is the most common form of vision loss caused by diabetes. Early symptoms of this type of vision loss include a blurring or distortion of the central vision. Depending on the location and extent of the damage, there are several laser treatments available to treat diabetic retinopathy. If there is macular edema, or swelling of the central retina, there is also a relatively new injection treatment that has become the standard of care. Injecting this medication into the eye can prevent further vision loss and even improve vision in many patients. Dr. Dieter Hertzog has performed over 3,000 of these types of injections and is now performing this treatment in-office. If you suspect that your diabetes is causing vision problems (that is, your central vision is becoming distorted, blurry, or hazy), please call us so we can determine if any treatment is necessary. The most important factor in diabetic vision loss is prevention. 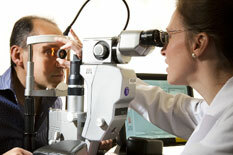 This involves an annual eye exam and close monitoring of blood sugar levels. If any sudden vision changes occur, a timely eye exam and treatment could prevent serious vision loss.